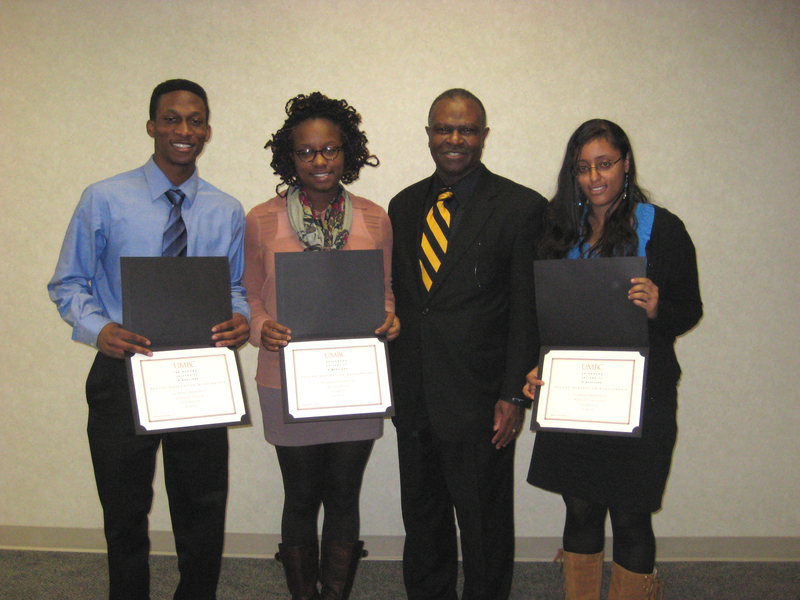 Three students were awarded the Second Generation Scholarship on November 9 during the W.E.B. DuBois Lecture featuring speaker Carla L. Peterson of the University of Maryland College Park. The annual lecture is sponsored by the department of Africana Studies. A group of African-American alumni started the Second Generation Scholarship in 1986 as a means to give back to the campus and become more involved in UMBC. The scholarship provides funding to continuing students whose money for college often decreases the longer they stay in college and graduate. Among the requirements, scholarship candidates must be currently enrolled or have taken a course in Africana studies and demonstrate a commitment to improving the lives of minorities through community service, extracurricular activities or other community involvement. Learn more about the scholarship here. The 2011-12 scholarship winners: Oseogie Okojie ’14, Nia Hampton ’13, founder James Wiggins Esq. ’75, and Mahelet Gennene ’13.